A documentary of an annual event where thousands of rattlesnakes are captured, taken to a coliseum, thrown into pits, then milked, butchered, skinned and eaten. 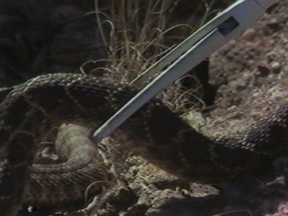 The event began twenty years ago out of a real concern to control the rattlesnake population. The true reasons for the roundup are revealed: the event was contrived for the psychological rather than the physical survival of the residents of the West Texas community.